I started My List of Lists as a creative outlet and hobby to chronicle the fun things I found around the web. Now, less than 2 years later, it is providing a full-time income. I get to stay home with my babies, blog when I feel inspired, and pay off our debt as I do something I love. Win/win right? Blogging is the perfect job. It’s a great way to be creative and work from home, while still contributing to the family household income. It has allowed me to pay off our cards, student loans and even buy a few new toys (camping trailer!) When I started My List of Lists, I truly had no intentions or even hopes of making much money at all. But I have been so blessed to be able to turn blogging from hobby into a livelihood for my family. So, I wanted to share with you just how simple it is to start a blog of your own. Nothing would bring me more joy than to help someone else start a blog that could get them closer to their financial goals. It’s important to start with a clear idea of what you are going to blog about! It’s okay to not entirely be sure, blogs can cover a variety of topics. Simply stop and think about what you are passionate about. Write down four to five general topics (food, DIY, cleaning, kids, home decor, etc) as a starting place. Remember that you will need to keep writing about these topics for a while, so be sure you are comfortable with your knowledge of these topics. When choosing your domain name be creative, but make sure it’s easy to say and spell, and stick with dot-com domains for branding purposes. Bluehost is really easy to set up and walks you through the process, step-by-step. Hosting allows your content to be available on the internet. 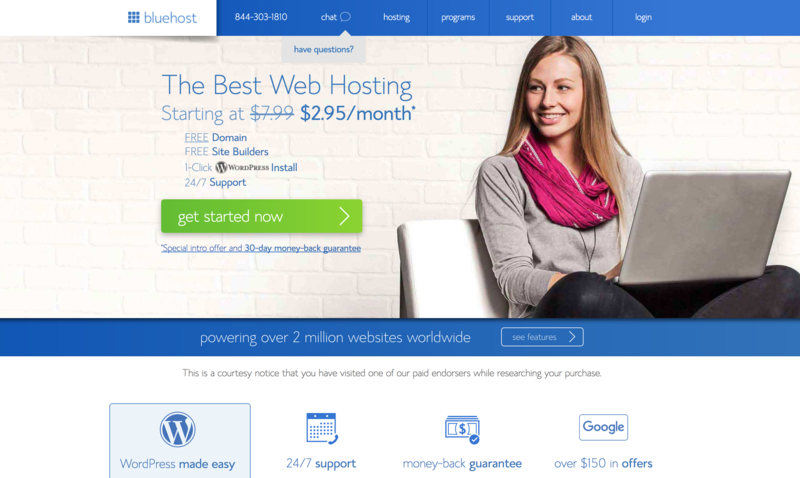 While there are a variety of hosting services to choose from, Bluehost is simple to use and are very well established. Click here to start setting up your hosting plan. Bonus times two! 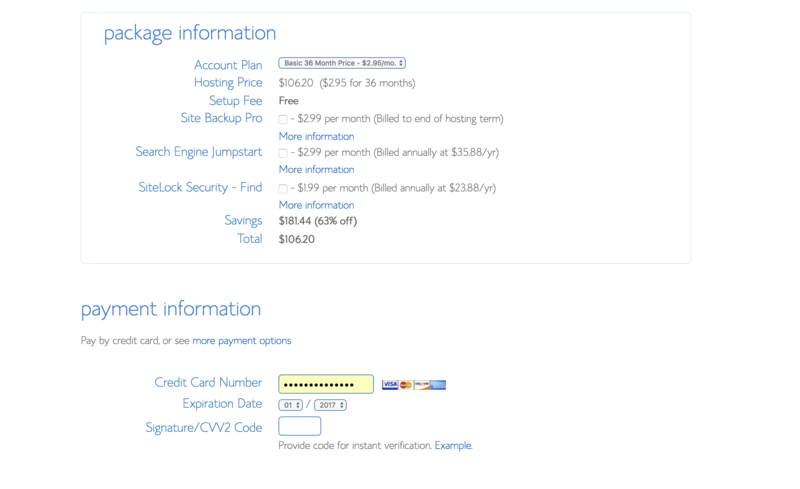 It comes with a WordPress install AND you get a special discounted price. 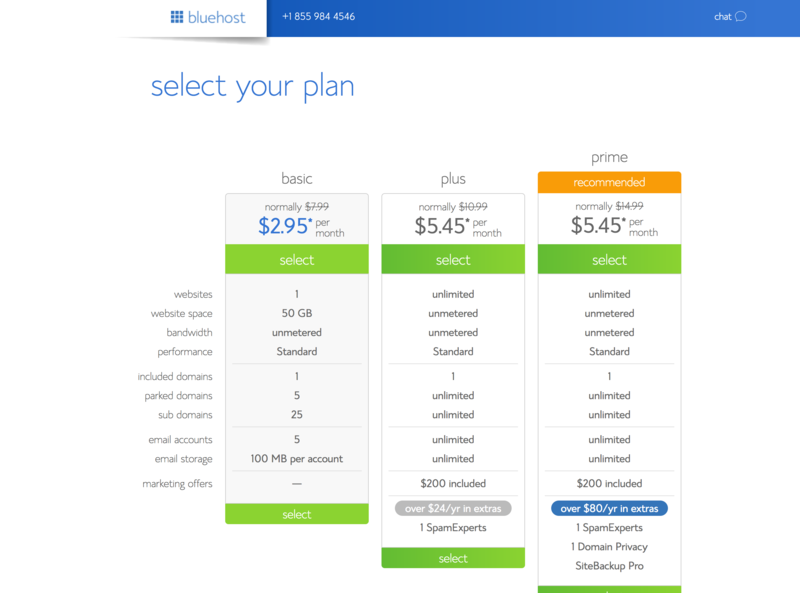 Once you have entered Bluehost, you will need to select your plan. You get to decide which one is best for you, though I would recommend going with either Plus or Prime simply because of the features you are allotted with those plans. When choosing your domain name be creative, but make sure it’s easy to say and spell, and stick with dot-com domains for branding purposes. 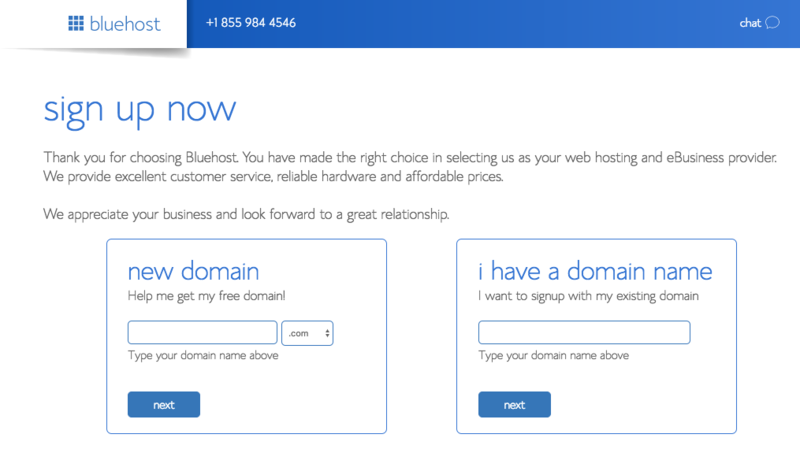 Bluehost is great because it allows you to set up a new domain or enter an existing one. After establishing your domain name, you will need to enter your personal information. Please be sure to use an email that you check often, this is going to be important for accessing your site information. Now you will need to pick your account plan. Here you can add on any extras that you might want to use. This is entirely up to you, and what you want to be getting out of your blog. If you get the option for Domain Privacy Protection, this is the one add on that I would strongly suggest you get. This keeps all of your private information secure on the internet. The last step in setting up your package is picking your password! Congratulations!! 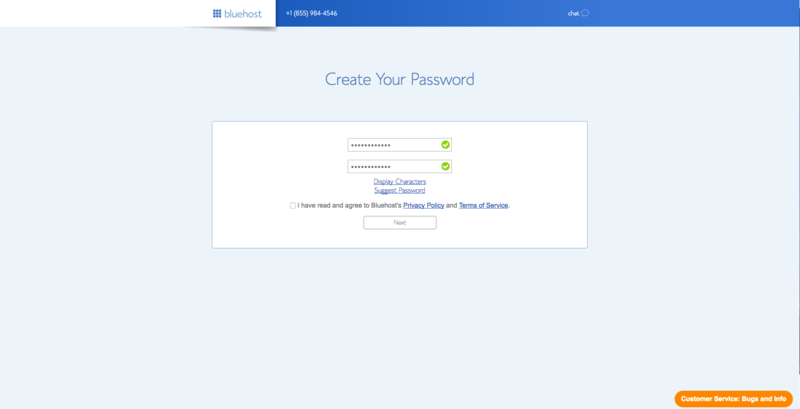 You are now set up with Bluehost to host your blog. 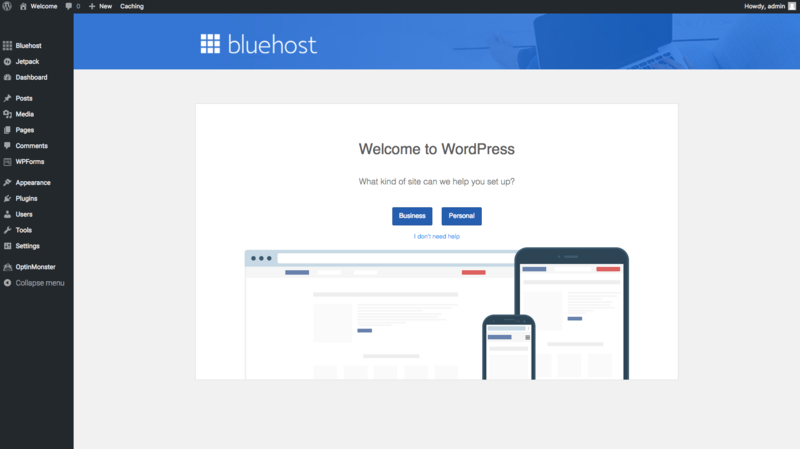 Since Bluehost wants to make everything as easy as possible for you, they have included a download of WordPress for you. WordPress is great and by far the most common ways to write your blog. Next, you want to choose a theme or template. Be sure to read about the different features offered in each theme, because they all offer different things. The differences might be small, but there is one out there that will display your site exactly how you want it to look. 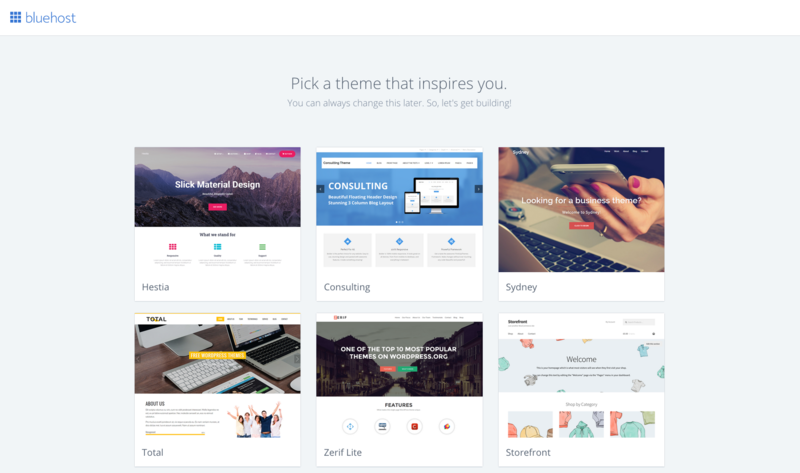 There are a lot of free themes you can choose from. Once you have picked your theme and installed it, you are ready to start setting it up! While it can be very confusing, follow the tutorial on how to start customizing everything. I learned so much about plugins, widgets, and how to work on WordPress just from the almighty Google. Every time I want to do something new on my blog, I ask Google. And I find a plugin to make the process easier. Don’t be afraid to find answers on your own. You can solve almost any problem if you research it. I highly recommend playing around with WordPress for a while. Look through all of the dashboard options so that you become more comfortable with it before you start doing anything else. Once you feel like you have a decent understanding of WordPress, you can start writing your blog posts! Also remember, if you ever feel like you’ve hit a snag or just don’t understand something, Bluehost has great customer service and will help you anytime you need. Making money on your blog is more than having a perfectly written blog. You need readers! I would suggest starting with social media. It is the fastest way to get your content out there. Send it out to your family and friends first, and as they share your posts, you get more exposure. Be sure to include social share buttons on your posts, so your readers can share it. Pinterest is one of the quickest ways to share your content with the world. Pin your stuff and share your great ideas with all of your followers. Share them on Instagram, Facebook and Twitter. If you have blogger friends with a lot of traffic or followers get them to promote your blog. Collaborate with others to draw in their followers also. Create an email list..this allows you to update people when new information is on your blog, have a place on there for them to enter their email and follow your awesome stuff! Google Adsense. It’s completely free, and every time someone clicks on an add…you get paid! Play around with placement, color scheme, etc. Sell private advertising to companies. Have an “advertise” tab on your menu and lay out pricing or have a media kit available to potential advertisers. Affiliate marketing- some companies offer a commission if someone clicks from your blog and buys something. There is a wide range of affiliate companies and networks. Sell an E-book- This is a great recurring income. Once you create it, they can download it from your site and you make money from each one you sell. Offer freelance writing for other blogs- this not only makes money, but gives your blog more exposure along the way. Product reviews- Feel free to contact companies and offer to do product reviews for them, or you can do product reviews for any companies listed on this comprehensive list. The beauty of blogging is that you are your own boss. You can work when you want to. You are doing something you love. You can choose your own hours. Aaaand, you can make thousands of dollars each month on your own schedule. GREAT ADVICE. THANK U FOR SHARING. WANTED TO DO BLOG JUST NOT SURE,HOW TO START. I will be goggling some things u mentioned. LOL. Widgets , PLUG INS,ETC.. I have a place to start, thanks to u. Thank u for all the info. I at least have idea where to start. I am gonna have to goggle some words u as, widigit, PLUG in, etc LOL!!! Think forgot to check a box. Great information..how do you make a salary off of blogging..? I would love to Blog!! November 14, 2012 – 12:25 pm P.S. Also, yes I too have seen that it takes a few months to help rankings and get traction. I also got a boost when I started using Google Plus cotsystennli! Hi! Thank you so much for this. I am new to blogging and uncertain of exactly what I need to do as I already have a wordpress blog but no hosting or registered domain. Do I do the same steps as you have listed in your post or do I need to do something else since I already have a blog? I have been late to the Pinterest game…but I LOVE IT! And now you tell me there is a way to make money simply by sharing my knowledge and learning a little about widgets? You are my new best friend. You will never know how much this information has meant to me. A world of thanks! You get a lot of respect from me for writing these helpful artslcei. Thank you for answering so many of my question. You have given me courage. How do you make an income from Blogging? Can you elaborate just a little bit more? I was sooooo excited to see a walk through on how to start blogging. But “easy peasy” turned out to be a nightmare thus far. I started yesterday to find first thing that there was no $3.49 to get me started through a link on this page. To get as far as even getting a domain name picked and registered took almost 3 hours, waiting waiting on phone and $285.00 for packages of what “I have to have” but don’t know what they are. So, OK…some things failed to get mentioned….but really??? I was trembled to the core so I thought I would wait until I was fresh this morning to look at my new domain. Of course, when I typed it in, there is no domain! Go figure. So, I try to stay patient, realizing that I am new at this, only to find BLUEHOST keeps you on the phone hours going from one person to another (half the day yesterday) and much of the morning today…they also keep the music playing but never get back to you and never tell you how long your wait is. This is day two and coming into the afternoon. Very costly adventure to be not one step further to having a domain, no where near blogging, and no bluehost to turn to but a tutorial anyone could have found on you tube…but…Really????? Unless you are a computer whiz, here is no way “let’s start blogging in 3 easy steps” is EVER going to happen. I am so sorry that you are having such a hard time. I do know that siteground.com is another great alternative. I have heard nothing but good things and their customer service is great. I wish you the best luck, starting anything new can be so hard. Thanks Sooooo very much for sharing your story & saving me the headache & grief… I will look elsewhere for starting a Webpage & Blog… wishing you much success in your venture…God Bless! Great tips, Amber! Thanks for the step by step.